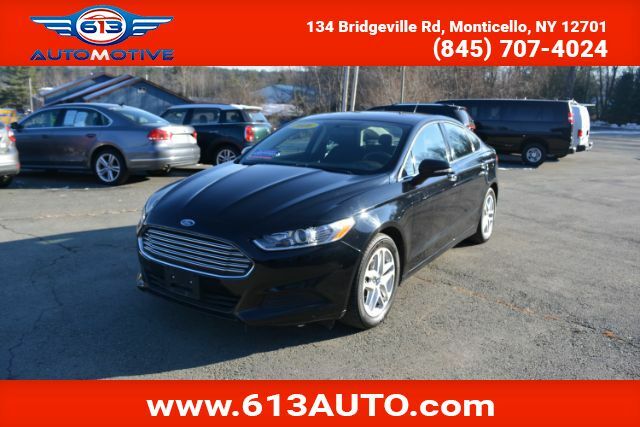 Our 2016 Ford Fusion SE Sedan is stunning in Shadow Black! It''''''''s powered by a proven 2.5 Liter 4 Cylinder that offers 175hp on demand while combined with a responsive 6 Speed Automatic transmission. This Front Wheel Drive machine delivers a quiet, vibration-free ride while bringing it up to 34mpg on the open road. The athletic physique of our Fusion SE exudes confidence with its amazing wheels and charming grille. Inside our SE, you will be riding in luxury with Fusion''''''''s leading-edge technology including Voice-activated Ford Sync with available SiriusXM and 911 Assist keeps you fully informed on your drive while playing the music you want to hear. In the driver''''''''s seat, you will find all of the controls easily within your reach, ample storage and many luxury features including heated mirrors, a backup camera, power-adjustable seats, and a sound system with CD player, auxiliary audio jack and a USB port/iPod interface. Ford offers eight airbags, ABS, tire pressure monitoring and electronic stability control, keep the people you care about protecting. MyKey even allows parents to keep the young drivers of the house safe by customizing settings such as speed and audio volume. You''''''''ve got to get behind the wheel of this Fusion SE Sedan! Print this page and call us Now... We Know You Will Enjoy Your Test Drive Towards Ownership!